It seems hard to imagine that it was only last year that people in Great Britain were celebrating the incredible sporting achievements of the Olympics. Whether it be the memorable moments of Mo Farah crossing the finish line, or the much-awaited triumph of Jessica Ennis- I think it’s safe to say that the Olympics brought many intangible benefits, for all of us. But what about the economic benefits? Did the Olympics succeed in its expectation to provide economic growth, or did it in fact fail to deliver? Well, with the official report on the economic benefits of the 2012 Games published on the 19th of July this year, the 2012 Games were said to have ‘gone out of their way to show that the Olympics more than paid for itself’; by generating an approximate figure of £10bn- almost £1bn higher than its cost. The report states that many of the benefits include the additional business that has been secured for UK firms and companies. For instance, some UK companies have won more contracts for other international sporting events, which adds up to the figure of £1.5bn, with £120m of this being business that UK companies have won, to help with the Rio Olympics. In addition to this, some sectors within the UK have benefitted greatly- including Britain’s construction sector. This is perhaps underlined by the fact that during construction, the Olympic site was said to be the largest building site in Europe. Therefore demonstrating how numerous jobs were given by the building of the Olympic stadiums and village, along with other investments in preparation for the games, such as the Queen Elizabeth Gardens. She claims that to make even a rough guess of the extra income generated by the games you would need to understand what would have occurred in Britain anyway if the Olympics had not taken place- in short, what academics would call "the counterfactual". Nonetheless, the report is vague in these areas- there is no mention of whether the £9bn would have still been borrowed by the government or whether any other forms of investment towards the country would have taken place. So for this reason, many experts are saying that we cannot be sure of the accuracy behind this report, and until further details are released, no further speculation can be made. Still, let's end on a more uplifting note! 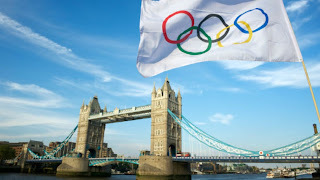 I’m sure everyone, regardless of whether they criticise the financial success of the Olympics or not, would say that the greatest aspect of the Olympics was no doubt its display and celebration of both personal and national achievement - not just for those competing and their coaches, but for the spectators both in person and through their televisions. Is Latin really making a comeback? Whatever happened to the 'F word'?